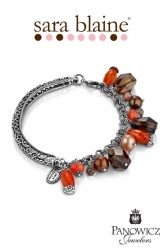 This exquisite bracelet features a half-angle, half-link bracelet design. The bangle side showcases an intricate design while the link side boasts cascades of dusty rose and earthy brown quartz, pearls, agate and topaz. Sara Blaine create beautiful jewelry that mixes unique colors to create timeless and elegant pieces. To Sara, jewelry-wearing is not just an accessory, but a statement! Please note this item will not be mailed without special arrangement, and if so, shipping costs may apply. You may also view and purchase this item in person at 1635 S. Gold St. in Centralia. If you have any questions, feel free to contact us at 360-736-3321.